Whether it’s in movies, comic books or video games, fans say there is diversity in the superhero universe. “I appreciate that they put a Chinese character in that game, and the fact that she’s a scientist and she’s smart. She’s helping save the world,” Ye said. FILE - In this Jan. 29, 2018, file photo, musician/actress Janella Monae arrives at the premiere of the film "Black Panther," at The Dolby Theatre in Los Angeles. For many African-American movie fans, the film “Black Panther,” released this year, was a milestone. “When ‘Black Panther’ came out, I was so excited to see my future children have something to look up to,” said Shanice Souvenir, who also attended Comic-Con dressed as Princess Shuri of Wakanda, a character in the movie. In recent years, superheroes in comic books and American popular culture have become increasingly diverse. But fans and creators say more work needs to be done, especially on the big screen, to fully represent American society. “Print, I think, tends to be able to get away with that first and kind of test the waters,” said freelance comic book writer Vita Ayala. University of Oregon director of comics and cartoon studies Ben Saunders agreed that initial risks can be taken with comics, a medium that can be more experimental than big-budget Hollywood films. But he said comic book superheroes have not always been so diverse. “The initial wave of superheroes of the 1930s and ’40s was predominantly male and always exclusively white,” Saunders said. Nonwhite characters at the time were stereotypes, said Nicky Wheeler-Nicholson, granddaughter of Malcolm Wheeler-Nicholson, founder of DC Comics. “African-Americans were always drawn with big white lips, which is just horrible. And the Asian characters’ skin tone was usually yellow, which is just weird. And so, they were usually the menace. They were usually the evil bad guy,” she said. 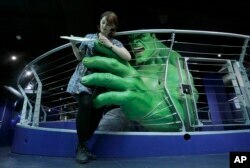 FILE - Madame Tussauds employee Marie Chandler poses for photographers beside a waxwork of The Hulk during the launch of the Marvel Super Heroes 4D exhibit at the Madame Tussauds waxworks in London, June 2, 2010. The first nonwhite superheroes did not quite look human and took the form of the green Hulk and The Thing, who is orange. “The Hulk is readily sort of understandable as a kind of complicated allegory for race, as a sort of figure through ideas of monstrosity,” Saunders said. In 1966, in the midst of the U.S. civil rights movement, Black Panther became the first black superhero in the Marvel universe, which Hollywood has embraced. “Black Panther” opened strong in China, earning $66.5 million during the first three days in theaters. Reviews in China have been lukewarm. “A lot of the times, I do hear that China doesn’t want to see black people or other people of color. Hollywood doesn’t think that diverse stories could sell overseas, so they make less of it, and they don’t give chances to diverse stories that could be good,” said Chinese-American Alice Mei Chi Li, who works as a freelance illustrator. In May, Marvel released its first Chinese superheroes in print. The Black Panther, the Hulk and other superheroes appear together in the latest Marvel film, “Avengers: Infinity War.” It has become Marvel’s most successful superhero movie in China and was granted a 30-day extended run.